The rise of beards among men has grown exponentially over the last 10 years. This trend continues on the uptick, and I believe it is here to stay for two reasons. Beards can actually improve one's appearance and the professional world seems to accept that a properly groomed beard is equally presentable as a cleanly shaven face. The key term though is "properly groomed". Just like other forms of first impressions such as dress or manners, an unruly or unkept beard could be a silent detriment to your career or social life. The QG has been on the forefront of the facial hair movement since it's founding in 2005 when we created the service for a "beard trim". 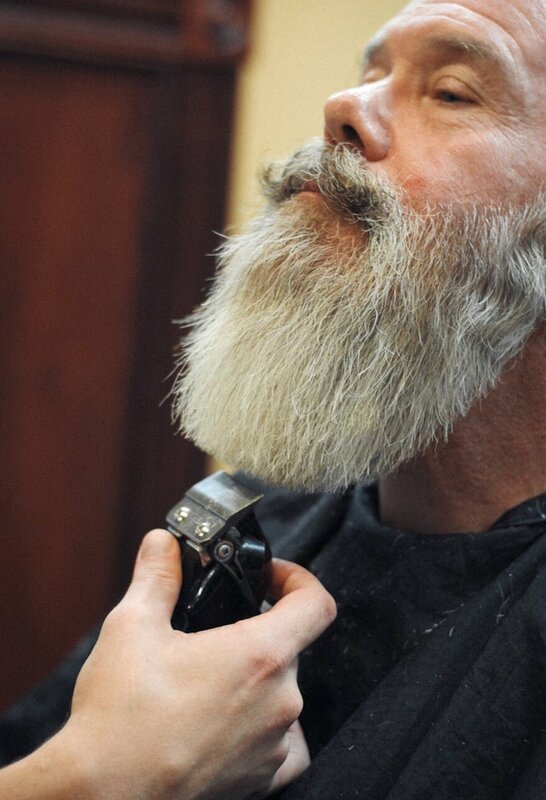 For this service, we blocked out an additional 15 minutes to properly trim and outline the beard. The latter doesn't seem to be such a big deal now, but the QG originally took some flack for offering a separate beard trimming service. In the old paradigm, barbershops would either not offer beard services leaving it up to you in your home or would include it in the price of the haircut. Most bearded folks, however, realized that although it sounds great to get your beard trim included for one price, barbers weren't giving their beards the attention they deserved because barbers weren't receiving any additional compensation for the extra time it took. In the last several years, as beards have become more commonplace, the length, fullness and styles have grown more diverse. For some of these beards, a 15 minute reservation is no longer adequate. Additionally, just as we are one of the only barbershops that wash and condition your hair after your haircut service, our bearded clients were asking for a similar service to help with their beard. Two services at the QG were born: The "Quinntessential Beard Trim" and the "Beard Cleanse". Finding the proper line to start and stop the beard as well as making it appear even are two of the most difficult jobs of our barbers. Let's get into the "why" in having a professional trim your beard. A proper trim promotes healthy growth. All hair grows at different rates, so having a professional trim and shape can actually help the beard appear fuller. Properly defining the line of the beard is one of the most common mistakes a do-it-yourselfer makes. Where should your beard begin on your cheeks and end on your neck? Our Quinntessential Beard Trim give us the time to experiment with all of the above and make sure we are giving you the best beard trim possible. We follow the trim with a razor shave of your cheeks and neck to ensure less irritation and crisper lines. Let's get into how our beard cleanse service can help as well. We use a five step process that is not necessary for everyday grooming but can make a difference on a monthly or at least quarterly basis. First, we use steaming hot towels to open your pores and soften your beard. Next, we use Brickell Face Scrub to remove from your whiskers environmental and product build up while exfoliating your skin underneath. We then cleanse your beard with Proraso Beard Wash: a mild cleanser that softens and smooths while removing dirt, debris and odor. We soften and condition the beard with one of our selection of Brooklyn beard oils. Finally we gently comb through and detangle ensuring your beard has healthy look and full great looking shape. All of the products we use can be purchased and used on a regular basis at home, but like our shave services, it's nice to have someone take care of you once in a while. Be on the look out for our next beard blog. It will address the question of whether a beard is right for you.